Blood collection sets are designed to increase the safety of routine venipuncture procedures. 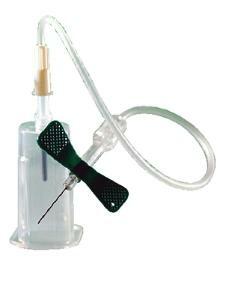 Sets consist of a single-use, sterile, winged blood collection needle bonded to flexible tubing. The winged needle is designed with a safety shield, which can be activated to cover the needle immediately following blood collection to aid in the protection against accidental needlestick injury. Sets are available with or without Luer adapter, with Luer adapter and holder, or with Luer adapter and HOLDEX® holder. The HOLDEX® standard holder is distinguished by its off-center Luer needle adapter, which provides a flat venipuncture angle. The protective shield is attached to the holder and, once activated, keeps the needle contained to help prevent needlestick injuries. The rotational shield can rotate 360° to provide user comfort. Holders are designed exclusively for use with VACUETTE® multiple sample drawing needles or VACUETTE® VISIO PLUS needles. The QUICKSHIELD Complete combines a safety tube holder and a VACUETTE® multiple sample drawing needle. The QUICKSHIELD Complete PLUS combines a safety tube holder and a VACUETTE® VISIO PLUS needle.